After pitching four no-hitters for Amphitheater High School (one of which lost to Bisbee, 3-1, when his catcher couldn’t hold on to his deceptive pitches), Kellner broke into professional ball as a 16-year-old and won his first game. He went on to become a 20-game winner for the Athletics, then stationed in Philadelphia. He became a major league star in his first season with the A’s under the watchful eyes of Connie Mack. 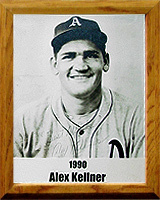 Kellner pitched for the A’s for eight years, then the Reds and Cardinals before retiring in 1959. He was never knocked out of the pitcher’s box in high school and was possibly the best pitcher ever turned out by a Tucson school. Kellner won 11 or more games five times during his major league career.